We survey the landscape, note what our contemporaries and competitors are doing, and do likewise. We might put a small spin on what we see, but we largely end up saying something mild and meaningless to avoid criticism. God forbid if we upset the applecart. Poppycock. Online, you must upset the applecart. Particularly if your livelihood is on the line. As my friend Joanna Wiebe said, the attention and sales go to the people who “say something of consequence.” That convinces people to take you seriously. And I’m not talking about being sensational here. Don’t say something controversial for the sake of controversy. Instead, dig deep during your research to uncover the hook — the one idea that takes a risk and stands out. 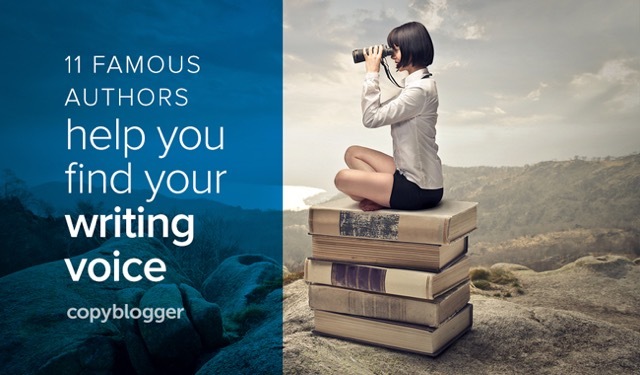 The angle, words, or voice in your content marketing that make people take a second look. Even if it is shocking. And speaking of voice, make sure you are comfortable in your own skin. Own up to your quirks and what makes you unique — indulge in those quirks. Listen. The tension between blending in to avoid criticism and standing out as a writer is not new. It’s something we have struggled with for ages, and thoughtful writers have been encouraging other writers to be bold. So, to remind you that you are not alone in this conflict and help inspire you on your journey to find your own unique writing voice, here are 11 insights from authors who ultimately took risks and said things of consequence. Don’t forget to grab your free PDF featuring these 11 author insights as printable mini posters. And scroll through our SlideShare presentation at the end of this article. Courage is not the absence of fear. Courage is doing something in the face of fear. We all doubt our abilities — no matter the amount of experience we have. You would think after writing hundreds of articles I wouldn’t need to fight that self-doubt. But I do. And so will you. The key is to fight it. And win. Remarkable writers live in their minds. They get lost in their thoughts and miss the greeting given by an acquaintance passing on the street. But don’t let anyone tell you that’s inappropriate. Your imagination is a gift. And your job is to translate what you see or hear in your mind onto the page. Certainly the more you challenge yourself, the more you will fail. But at least you will be failing forward. Learn from your mistakes, recognize your weaknesses, and enhance your strengths. This process can only happen when you throw yourself into the unknown. How open you are about your struggles depends upon how comfortable you are talking about yourself. I’m honestly not very comfortable talking about my challenges. I debated sharing that entry above about my insecurities six times before I decided it was okay to share, because it supported what I was saying. Find your comfort level, and then share. You will draw people in, and they will warm up to you and your work. When it comes to creating content, go beyond what everyone else is saying. In fact, try to go 10 times beyond what other people are saying. People send me links to articles they’ve written all the time. I look at every single one of them. And I read the ones where the person has added an original thought to the conversation, rather than repeated what’s already been said. I love the Internet as a writer because I can hit publish and within 24 hours people will respond. Often, I will share ideas that I know are premature — or I feel are not correct — so that a reader’s objective point of view can help me see what I’m missing. However, you will only grow from this feedback if you are humble. One of the reasons I find new social situations awkward (and can come across as shy or stuck-up) is because I’m often reluctant to open my mouth and commit to a position until I’ve thought it through. The last thing I want is to sound dumb. So I do most of my thinking on paper. This is how I process my own feelings and experiences in the world. Don’t be ashamed if this is how you are as well. It’s yet another trait of remarkable writers. Great ideas have a tendency to keep coming back. This is one of the reasons I’m not quick to whip out a notebook every time I have an idea. I trust the process. I trust (and my suspicions have been confirmed by experience) that truly great ideas will stick around and make themselves known. So if you have an idea that will not go away, it’s probably time to commit it to paper. There will never be an ideal place to write. An ideal time. An ideal topic to write about. Nor will you be able to match what you see in your head to what you put on the page. It will be messy. But hard work will make it beautiful. You just have to know when to abandon it. This quote from Mitch Albom is the culmination of everything I’ve been saying up to this point. When we refuse to say things of consequence, we ultimately hide in the shadows, filled with shame and regret — full of should’ve, could’ve, and would’ve. Click to download our free 11 Insights on Finding a Writing Voice Readers Take Seriously PDF (5.5 MB). Print your favorite words of wisdom and keep them handy while you work. Being a person of consequence starts by saying things of consequence. Yes, you’ll be taking a risk, but you also take a risk when you blend in — you risk obscurity and financial failure. The last thing we need are more rank-and-file writers. So, do me a favor: Vow to be a writer who people take seriously. A writer who says things of consequence. Who, in spite of fear and risk, wants to push the conversation to uncomfortable, but unique, original, and evocative levels. Vow to be a writer people can’t ignore. You’ll be in good company. Now check out these 11 author insights in our SlideShare presentation below!